Back-Roads Touring has just been announced as the winner of Best Small Escorted Tours Holiday Company and Best Small Coach Holiday Companyfor the fourth consecutive year in the prestigious 2018 British Travel Awards. Their sister company, Topdeck Travel was also awarded Best Overall Escorted Adventure Holiday Company on the night. Back-Roads Touring has more than 30 years’ experience in small group and tailor-made tours across the UK, Europe and South-East Asia. Topdeck Travel specialize in youth group touring for 18-39s spanning across Europe, Asia, Australia & New Zealand, North America, Africa and the Middle East. Back-Roads Touring and Topdeck Travel’s General Manager – Global Sales, David Gendle, said they are honored to once again be recognised as winners in the British Travel Awards. 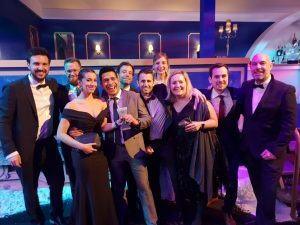 “We take a lot of pride in putting the customer at the heart of everything we do, and the British Travel Awards validate the collective efforts of our team,” he said. “For Back-Roads, we’ve spent more than 30 years creating tours that cater to the mature traveller’s demand for authentic local experiences, culinary excellence and premium quality. For Topdeck, we pride ourselves on ensuring we’re creating life-changing travel experiences that incorporate the perfect mix of unique and hassle-free trips for young travellers. The announcement was made at a glamorous Gala Awards ceremony, held in London and attended by more than 800 travel industry professionals. British Travel Awards’ Chief Executive Lorraine Barnes Burton said “Back-Roads Touring and Topdeck Travel are to be congratulated on winning the three awards between them. “The British Travel Awards are the only travel industry accolade voted for exclusively by the consumer and the Awards serve to recognise all that is great about travel, as experienced by the travelling public.